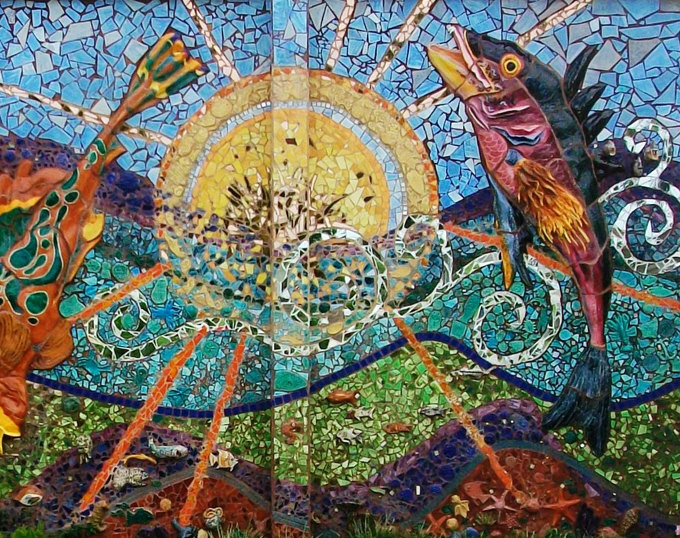 Ocean vegetation and animal life were the inspiration for this individually sculpted glazed ceramic mural based on the teacher’s curriculum. Funded by a grant, Beth Ravitz designed the mural and coordinated the installation finding over 1500 people from the community. Many from the community participated and created a small sculpture or fish /plant life for this mural and helped install it. 144″ H x 501″ W Total cash budget: $45,000.00. 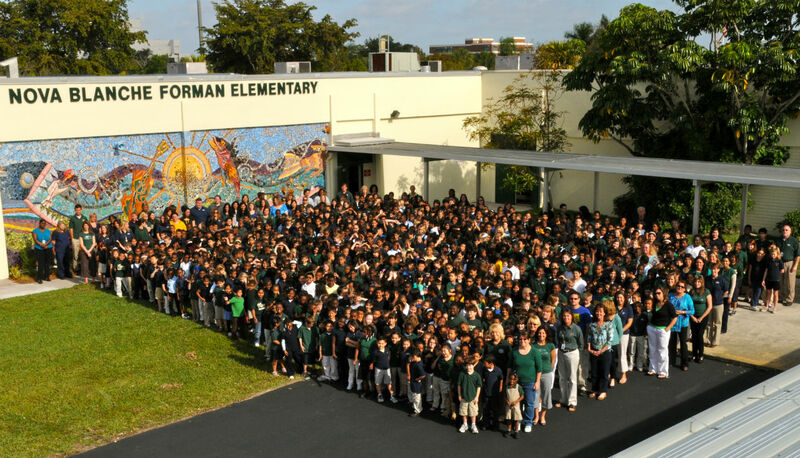 Nova Blanche Forman Elementary School is located at 3521 Davie Rd, Davie, Florida in Broward County. 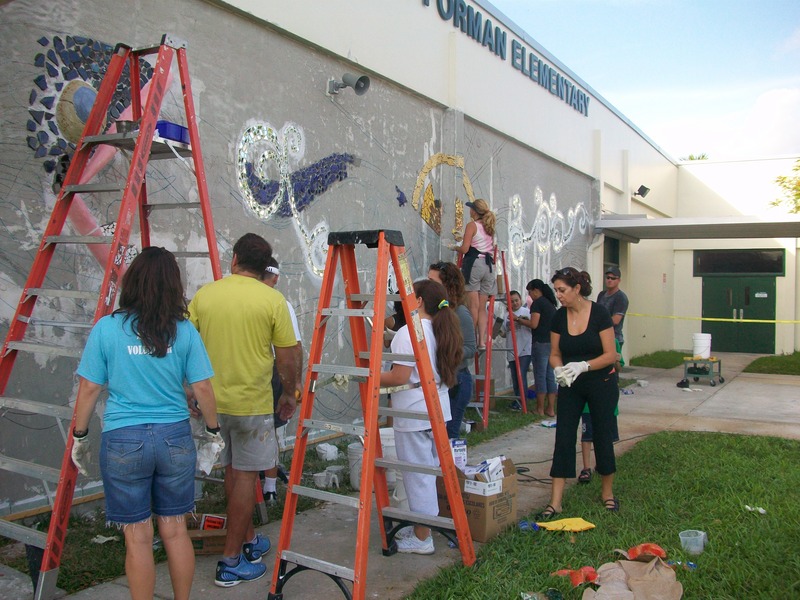 Nova Blanche Forman Elementary School Art Teacher, Pam Brown, contacted me about a new mural for the school. Pam wanted to plan her curriculum on themes of the Ocean, as she had been given a large fish tank including a knowledgeable person who would supply fish , cleaning and maintenance. In addition, a tech person volunteered to hook up the tank with a camera that hooked up to a large screen so that an of all that was happening in the tank was projected onto a wall of the classroom at all times…simply delightful! We placed books, magazines, and information with links to the ocean, including both fish and plants, and sent notes home to include parents . 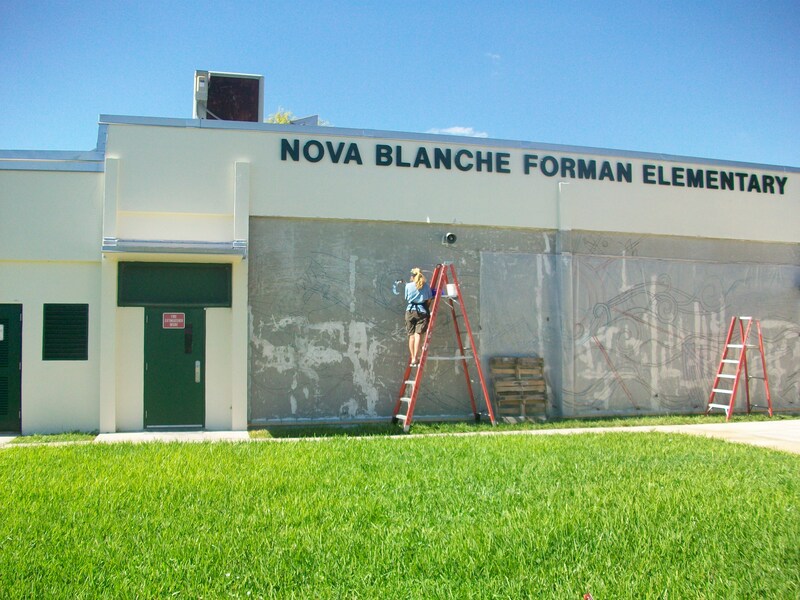 Because Nova Blanche is located in an educational hub, we included Broward College ceramic dept, as well as Nova Middle and High School teachers and professors. To entice the students to help, they were told they would receive service hours if they worked on the install after school. After giving a PPT presentation in the auditorium to all at Nova Blanche explaining the process, I went into the other schools to give demos and pass on information. I requested sketches from all that wanted their ideas to be included in the final sketch for the mural. After a few weeks, all the sketches were gathered, and I created a composition using as many ideas as possible from the sketches. In addition, instead of using solid color tiles (I buy white tile, have students glaze them in the selected color palette, and crack them), I gave the elementary school children slabs of clay and told them to create a sculpture of a fish or plant. It could be real or imaginary. We then glazed a series of these sculptures in the color palate and used them in place of solid tile for the background. From a distance they looked like a solid color; when viewed up close, it was a charming sculpture. A 42 ft wide x 12 ft high life size cartoon was drawn. I had created a drawing based on a scale of 1 inch = 1 foot. We took this out at night, projected it onto the wall, and a group of volunteers drew with markers onto the wall. The following day, another group of volunteers placed clear plastic on top of the wall and sketched a working drawing to use as a pattern. I worked with the high school advanced placement teachers. Each student had to sculpt either the head or tail of a fish. The students learned how to fire the kiln, and how to glaze. After school they came to the elementary school and helped to install the mural . 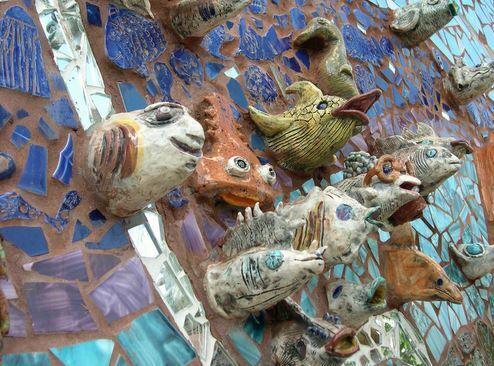 Their sculpted fish were adhered to the wall so that it looked like they were swimming into or out of the wall. Pam and I each sculpted giant 9 feet fish for the mural. Throughout the process, parents, staff, teachers were informed through flyers, notes in mailboxes, and messages on the schools website. All were invited to contribute at any time., and to especially donate tile, dishes, and anything they thought could be useful. This method always seems to take on a life of its own…and the mural’s ownership transfers to the community and all that participate. When it was time for the actual installation, it took place after school and on the weekends. Lighting, tools, scaffolding, food and anything we needed always seemed to appear. I had to tear people away from the wall…as it became addictive and intoxicating…people did not want to leave!